A wonderful client who does beautiful work! "I wanted to say I appreciate the creativity and professionalism you have brought to our website and the continuing updates we have needed. Thanks for that and feel free to use our name as an enthusiastic reference." One has to make sure to take care of family, as such Whitestar is thrilled to take care of the Strauch Fiber Equipment web presence. "In today's rapidly moving age, a web presence is essential. When my manufacturing company needed a user friendly and informational website, we asked Whitestar Data Solutions what they could do. Whitestar is owned by my son, Mark, and yes, nepotism can be an issue. However, no worries. He proved to be ethical and treated me with same dedication as he would any client. My website was very professional designed and is also being efficiently hosted by Whitestar. I can honestly say that a great part of the growth of my company sales is directly attributable to my professional looking and easy to navigate website." Whitestar is currently responsible for the IT support at ARServices, a government consulting services provider. "The network support, backroom to desktop, that WhiteStar Data Solutions has been providing ARServices during the past three-plus years has been nothing short of “outstanding”! The IT subject matter expertise, customer focus, and personalized attention, that Mark Strauch delivers, provide a high level of professional comfort and has made us feel that ARServices is his most important client!" Mr. Strauch took over the daily computer network administration of a growing nonprofit organization that required immediate reconfiguration and attention. Very quickly it became obvious that Mr. Strauch was an expert in all aspects of Microsoft Network Administration and went beyond the call of duty. He possesses the skills, knowledge and abilities found in someone who understands every aspect of the small growing organization and truly demonstrated precisely the meaning of the word consultant. Whitestar donated their time to design and maintain the website for Antietam Elementary School. They have since moved to a new county standard site, but it was a pleasure to assist my daughter's school when needed. 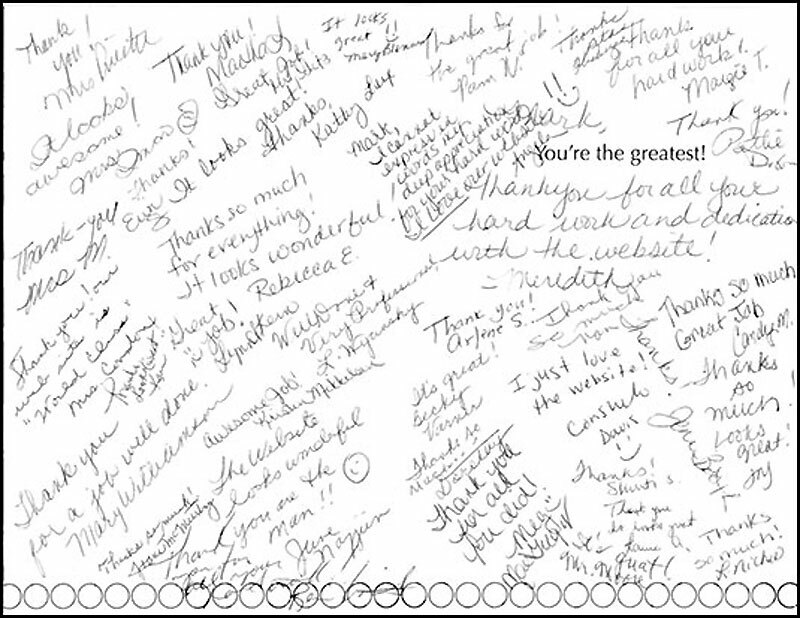 Below is the wonderful thank you card received from Antietam faculty for work done on their site.